The Music City Center opened May 2013 and boasts stunning views of the Nashville skyline and, in keeping with the city's commitment to sustainable development, a 4-acre green roof. Located in downtown Nashville, the new Music City Center is adjacent to many Nashville attractions including the Country Music Hall of Fame, Bridgestone Arena, and the pedestrian friendly Broadway Street with live music 24/7. The state-of-art convention center is the newest addition to an exciting and vibrant downtown. Major industries in Nashville include: Automobile Production, Finance, Health Care Management, Higher Education, Insurance, Music Production, Printing & Publishing, Technology Manufacturing and Tourism. Some of the largest employers include Vanderbilt University and Medical Center, HCA, Nissan, Gaylord Entertainment, Kroger, Asurion, Dell Computers, and Electrolux Home Products. 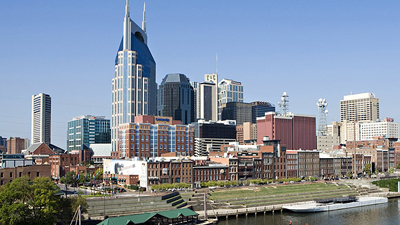 Over sixteen higher education entities (colleges, universities and professional schools) are located in Nashville.